Segejs has been telling us about Nokia Gulp since early June. WOMWorld invited us to come down to Wales and check out their secret filming of the world’s biggest stop motion animation (after the record breaking smallest stop motion). I was stuck in Manchester at the time but thanks to Segejs, we had daily feedback on what went on. Being shot on the N8, and with stills, the video of course can be of much higher quality. Nokia have uploaded mainstream youtube maximum of 1080p. ‘Gulp’ is a short film created by Sumo Science at Aardman, depicting a fisherman going about his daily catch. 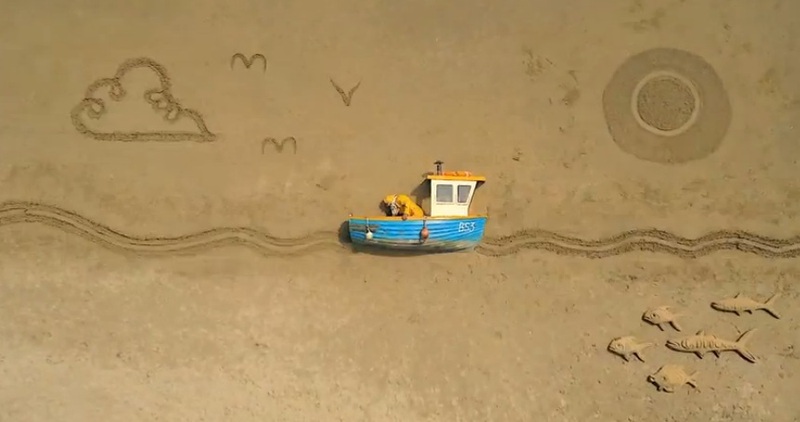 Shot on location at Pendine Beach in South Wales, every frame of this stop-motion animation was shot using a Nokia N8, with its 12 megapixel camera and Carl Zeiss optics. The film has broken a world record for the ‘largest stop-motion animation set’, with the largest scene stretching over 11,000 square feet. I’m actually not that far from where this was shot. The video was quite short so you’ll want to watch the making of video. It’s all quite difficult to get the sense of scale until you see the ant things moving about are actually people. Here’s a film taking you behind the scenes on ‘Gulp’, Aardman’s world record breaking short film. It reveals what went in to making such a complex film outside and away from the controlled environment of a studio, and how it was shot using a Nokia N8. I think Sergejs gave us this video (or part of it) in a teaser? « Ovi Calendar Web Access ending soon.